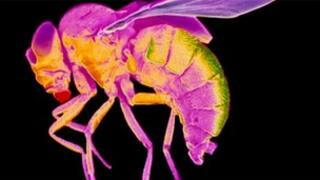 Scientists believe they have discovered a clue to why women tend to live longer than men - by studying fruit flies. Writing in Current Biology, they focus on mutations in mitochondrial DNA - the power source of cells. Mitochondria are inherited only from mothers, never from fathers, so there is no way to weed out mutations that damage a male's prospects. But one ageing expert said there were many factors that explained the gender difference in life expectancy. By the age of 85, there are approximately six women for every four men in the UK, and by 100 the ratio is more than two to one. And females outlive males in many other species. In the research, experts from Australia's Monash University and the UK's Lancaster University analysed the mitochondria of 13 different groups of male and female fruit flies. Mitochondria, which exist in almost all animal cells, convert food into the energy that powers the body. Dr Damian Dowling, of Monash University who was one of the researchers, said the results point to numerous mutations within mitochondrial DNA that affect how long males live, and the speed at which they age. "Intriguingly, these same mutations have no effects on patterns of ageing in females," he said. "All animals possess mitochondria, and the tendency for females to outlive males is common to many different species. "Our results therefore suggest that the mitochondrial mutations we have uncovered will generally cause faster male ageing across the animal kingdom." They suggest this is because there is no evolutionary reason for the faults that affect males to be picked up - because mitochondria are passed down by females. Dr Dowling added: "If a mitochondrial mutation occurs that harms fathers, but has no effect on mothers, this mutation will slip through the gaze of natural selection, unnoticed. "Over thousands of generations, many such mutations have accumulated that harm only males, while leaving females unscathed." Tom Kirkwood, professor of ageing at Newcastle University said the paper was "intriguing". He said: "It may be it does tell us something rather important about mitochondria and the difference between male and female fruit flies. "And we know that mitochondria are important for ageing in a number of species. "But I certainly don't think this is a discovery that explains why women live five-to-six years longer than men. "There are other things we know also count - lifestyle, social and behavioural factors. But the biggest difference in biology is that we have different hormones."